Several hundred demonstrators, in defiance of a ban on protests, rallied in the Algerian capital Friday against a bid by ailing President Abdelaziz Bouteflika for a fifth term, an AFP correspondent said. 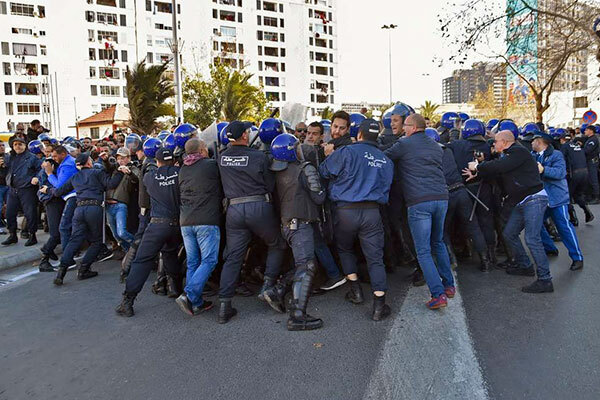 “No fifth mandate,” chanted the mostly young demonstrators, many waving Algerian flags, as they started to march through central Algiers without police intervening despite a heavy deployment and a helicopter hovering overhead. “Ouyahia, get out!” they also cried around the capital’s landmark Grand Post Office, referring to Prime Minister Ahmed Ouyahia. 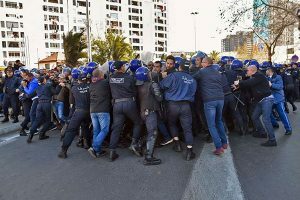 Activists used social media to call for Friday rallies against Bouteflika across the country after the weekly Muslim prayers, also filling the main square in Annaba, 400 kilometres east of Algiers with demonstrators, and the TSA news website said. Bouteflika, the 81-year-old head of state who uses a wheelchair and has rarely been seen in public since suffering a stroke in 2013, announced on February 10 that he will run for another term in April presidential polls. His office announced Thursday that Bouteflika, who has been in power since 1999, will travel to Switzerland for “routine medical checks” ahead of the April 18 election.